Just had a major flashback to shopping in KB Toys with my brother like 2 decades ago. I used to have a ton of these guys. I still have a couple of these. I know they're M.U.S.C.L.E. knock-offs, but for some reason I thought I got mine from coin dispensers or as arcade prizes, could you actually buy these in stores? I was a big fan of these guys, but even moreso the cards that I got when I bought a Slurpee at 7-11 when I was a kid. I bought Slurpees religiously to try and collect the whole set. I loved the little bios on the backs of the cards. They were made by Matchbox in the VERY late 1980s and early 1990s. They were a totally originally concept as far as the designs went (UNLIKE M.U.S.C.L.E. which borrowed all its molds from Kinnikuman in Japan). They are awesome, and I hear you can learn more about them in the latest issue of Toyfare, on sale now! 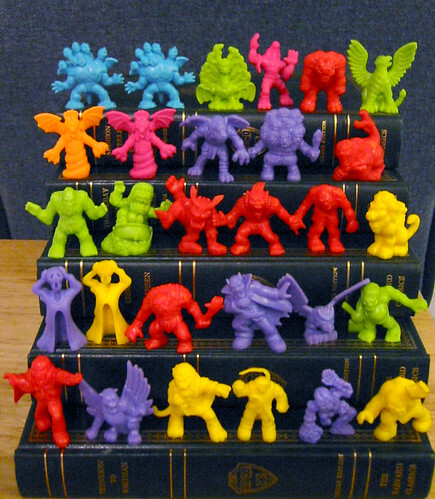 i LOVED monsters in my pocket!!! i even got a mail away poster etc. @Ben: Cool, thanks for letting me know. I remember monster in my pocket, I just didn't know that these were they. I have no idea how or when I bought these, but I have some. Sorry to bother anyone by calling them M.U.S.C.L.E. knock-offs, that is just what they were for me when I was a kid as I would have them fighting one another. Was a huge fan back then, and I bought the entire Series 1 and 2 two years ago. One day, I gotta get the large volcano display.